If the Seahawks win on a missed chip-shot field goal . . .
And if the Steelers win because of horrible officiating . . .
And if Aaron Rodgers and Andy Reid make you feel stupid for betting against them . . .
And if the Bengals, Vikings, Redskins, and Texans all lost in horrible fashion . . .
That can only mean one thing: It’s the NFL playoffs! Of the remaining eight quarterbacks, one has never won a playoff game, two have never made it to a Super Bowl, and the other five share a combined nine championships. I wonder if that information will play any significant role in which teams I predict to win this week. It sure as hell didn’t last week, when I took A.J. McCarron and Kirk Cousins, and they each broke my heart. But hey, when you play with matches, you tend to get burned – kind of like how if you send your linebackers coach on to the field to incite the opposing team in order to draw a late-game penalty, you get condemned by league officials. Or if you purchased illegal HGH supplements and had them shipped to your house under your wife’s name, you get publicly criticized. Or if you are found not guilty of deflating footballs, you still get unfairly ostracized by the media. Yep, it’s the NFL playoffs and I am in a bitter mood! Saturday, January 16, 4:35pm EST, CBS. In the first half of the 2015 season, the Patriots were the 2014 version of themselves (unstoppable on offense, annihilating teams every week, playing angry, disciplined, mistake-free football). 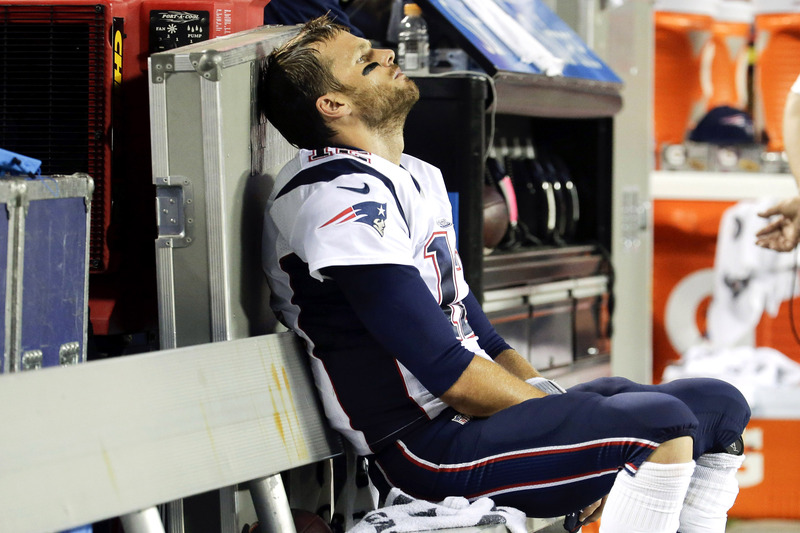 During the second half, however, the Patriots were the 2013 version of themselves (ridden with injuries at every conceivable position, eager to run the clock to get out of games without suffering further injuries, no consistent running game to speak of). So heading into this week, it is more than understandable to ask the question: Which team are they? The 2013 team, which limped into the playoffs without its biggest weapons and subsequently lost in Denver, or the 2014 Super Bowl championship team? For the moment, let’s stick to what we know. The Patriots have historically dominated the divisional round in the Brady/Belichick era, winning eight out of a possible nine home games. The Chiefs are coming off their first playoff victory in two decades over a team that should have never made the playoffs to begin with. The Patriots are expected to start several of their biggest players who have been sidelined due to injury (including Julian Edelman, Danny Amendola, and Devin McCourty). The Chiefs have some injury question marks, none bigger than Jeremy Maclin and Justin Houston. But then there are the things that make me nervous as a biased Patriots fan. One is that Kansas City has won 11 straight games; we had a similar streak in 2003, and when you win that many games, you panic less, come together as a team more, and eliminate the kind of intimation Bill Belichick teams typically thrive upon. Conversely, the Pats finished the season 2-4. Of course, we were banged up and perhaps mucking around to avoid getting the one seed for some unknown reason (kind of like how we inexplicably kicked off to the Jets to start OT a few weeks ago). No one ever said being a Patriots fan wasn’t interesting. Another scary element looming in the minds of Pats fans is the last time we played the Chiefs – you know, when Trent Dilfer called Tom Brady old and said we would have to start playing Jimmy G. But should we put a lot of stock in that game? At the same time, I wrote last week that many of the Chiefs’ wins during their current streak are unimpressive (last week was a beautiful illustration of that), and as I said above, at least a few of the Pats’ late-season losses were due to trying to avoid the Steelers injuries. New England loses when three things happen: When Tom Brady is pressured and sacked; when they cannot run the ball (2-3 in games of 70 or fewer yards); and when they score under 27 points (1-3 in such games this season). Essentially, we can chalk those three factors to one simple strategy: The Chiefs’ defensive line has to play outstanding. When Tom Brady is given time in the pocket, as the Ravens and Seahawks crucially permitted him last season, the Patriots are virtually impossible to beat, and that’s not even considering when Edelman and Gronkowski playing at their highest levels. The Chiefs sacked Brian Hoyer three times last week, and forced four interceptions; but I think it’s safe to say that Hoyer is not Tom Brady. At this point, you may be thinking, “OK, so the Chiefs defense, which specializes in stuffing the ground game and pressuring the QB, may have the advantage. But they still cannot score points.” Well, that deserves a more careful look. The four quarterbacks who managed to beat New England this year were Brock Osweiler, Sam Bradford, Ryan Fitzpatrick and Ryan Tannehill (suddenly the name “Alex Smith” doesn’t seem all that bad). Two of those losses came when the Pats blew two-touchdown leads; in the other two we gave up 300 yards through the air, 5 touchdowns, and zero interceptions. Want more? This season, the Pats defense only had five games with multiple takeaways. Compare that with nine such games each in 2014 and 2013. Including last week, the Chiefs have nine games where the offense scored 26+ points, and seven of those games were on the road. The Pats were 3-3 in games giving up 26+ points. The Chiefs aren’t exactly an electric offense, but Charcandrick West, Spencer Ware, and even Alex Smith are all better running options than the Pats’ best runningback. They doubled the Patriots turnover ratio (+14 compared to +7) and played a much tougher schedule (Kansas City only lost one AFC road game all season). There’s no combination quite like Bill Belichick and Tom Brady, but Andy Reid and Alex Smith each have considerable playoff experience too. The Patriots come into the game with more off-field drama and higher expectations; having thrilled an already ecstatic Kansas City fan base, the Chiefs should come into the game feeling like they are playing with house money. It may be shocking to say, but here goes nothing: I think I have to pick against my beloved team. I can’t help but notice the eerie parallels between this Chiefs teams and the other teams we’ve blown playoff games to (specifically, the Mark Sanchez-led Jets and the Ravens): An offense prioritizing ball control, a brutal defensive line, prior success against the Patriots, and a fearless coaching staff. The 11-game winning streak may give the Chiefs too much confidence, but watching them last week (in an admittedly one-sided game), there wasn’t any discernable sense of cockiness or hubris. The best-case scenario for the Patriots is, like they’ve done so many times before, Tom Brady shuts up all the doubters, they build a quick 14-0 lead, and the environment of Gillette Stadium in January intimidates the opponent into submission. The problem is, sadly, I believe the Patriots really tried to win many of those games they ultimately lost down the stretch, while the Chiefs have played the last three months unafraid of anyone or anything. Playoff doppelganger: 2010 AFC Divisional Round, NY Jets 28, New England 21. Because of course. This game took me many years to recover from, but when I finally overcame it, the feeling was so sweet. Serenity now, serenity now. Saturday, January 16, 8:15pm EST, NBC. The writing was on the wall going into last Sunday, when everyone was picking Washington over Green Bay. It’s never good when you are the trendy, popular pick; just ask Mark Helfrich. Meanwhile, everyone did not relax and forgot that they were picking Kirk Cousins over the Super Bowl champion, two-time league MVP, and Mr. Olivia Munn. It’s fair to say that the Packers resemble the Patriots in how erratic and bipolar they’ve looked down the stretch, due in large part to injuries. Since October, they’ve won just four games – against Minnesota, Dallas, Oakland, and the Hail Mary in Detroit – and when you add in last week, the Packers’ resume doesn’t look that outstanding. I mean, this is the same team that lost to Denver, Carolina, and Arizona by a combined score of 104 to 47. But like the Patriots, maybe Green Bay’s M.O. has been to rest everyone and don’t worry about giving maximal effort until the postseason. Hell, that always seems to work for Eli Manning. It’s also possible that the Redskins were a fraudulent team that won nine games in a horrific division, but any time a team can win by 17 points on the road – especially after overcoming an early deficit of 11 points – the result is impressive and merits consideration. Obviously, the Cardinals are a much more difficult challenge for Green Bay, particularly because they beat the Packers by 30 on December 27. But if you accept the logic that Green Bay wasn’t playing at full strength or effort for much of the season, you may have to throw out much of what that game appeared to demonstrate. And what did that game show? Green Bay’s offensive line was awful, giving up an unbelievable eight sacks, while Corey Redding and Jerraud Powers each had fumble returns for touchdowns. Arizona’s secondary was even more outstanding, limiting Rodgers to 151 yards and only one touchdown. Meanwhile, the Cardinals offense did what it has done all year – create big passing plays down the field, enable a consistent and diverse running game (David Johnson, Andre Ellington, and Kerwynn Williams each had at least seven carries for 39 yards), and limit turnovers. At 36 years old, Carson Palmer is coming off the best statistical season of his career, throwing for over 4,600 yards, 35 touchdowns, and most importantly, not getting injured. That critical caveat is what worries me most about Palmer. In his career, he has missed 32 games due to injury. Injuries have also sidelined Tyrann Mathieu and Chris Johnson, both of which are huge blows to this team. In spite of this, Arizona looked great down the stretch – that is, until two weeks ago when the Seahawks demolished the Cardinals at home (in a game in which every probability seemed to be pointing toward Palmer taking a Michael Bennett hit and being sidelined for the playoffs; instead, that hit was made by N’Damukong Suh on Tom Brady). Like the Patriots and the Packers, that late-season loss was alarming; but was it a meaningless game in which starters were rested, or does Arizona really have some gaping holes to fix? In many respects, the Cardinals may have had the most balanced and complete team in the league in 2015, but besides the injury worries, one thing also strikes me about them: Outside of that Packers victory, they don’t have too many impressive wins on their resume. True, they beat the Seahawks in Seattle, and the next week took care of business at home against the Bengals – but look at the rest of the teams they beat: New Orleans, Chicago, San Francisco (twice), Detroit, Baltimore, Cleveland, St. Louis, Minnesota and Philadelphia. No Carolina, no Denver or New England, and their non-Seahawk losses were to the Steelers and Rams. You can’t control what schedule you get, but Arizona’s is a little suspect. Two other observations about the Cardinals’ losses this year: In each of the three games, they gave up over 120 yards on the ground and could not force a turnover (conversely, they had three giveaways in each game). Last week, the Packers had 141 yards rushing and only turned the ball over once. Green Bay had eight games where they didn’t turn the ball over at all, while Arizona had eight games with multiple giveaways. If there was any lesson learned last weekend, it was: Don’t discount the experienced playoff QB. Rodgers, Russell Wilson, Alex Smith, and Ben Roethlisberger beat Kirk Cousins, Teddy Bridgewater, Brian Hoyer, and A.J. McCarron. I think Palmer is in a class just above those last four guys, but he’s still 0 for 1 in playoff games (I don’t count the Steelers debacle in 2006), while Rodgers just won his fourth road playoff game. Including last week, five of the six games where the Packers scored 29 or more points came on the road. Outside of Sam Shields and Quinten Rollins, the Packers’ defense is the healthiest it has been all season, which is probably the same thing you can say about the Green Bay running game. David Johnson has been great for the Cardinals, but he is still a rookie, while players like John Brown, J.J. Nelson, Deone Bucannon, and Markus Golden are still in their first couple years as pros. Meanwhile, everyone is picking against Green Bay once again, which is exactly the way Aaron Rodgers likes it. It’s a tough call but in this circumstance, I say experience means something. Playoff doppelganger: 2008 NFC Divisional Round, Arizona 33, Carolina 13. Cardinals fans will certainly remember this one: Stumbling into the playoffs, with no one giving them any chance, with no running game or consistency to speak of, the wily veteran Kurt Warner defied all the odds and showed why experience and a strong arm are two of the most important commodities to have in a postseason run. Like the 2015 Cardinals, the 2008 Panthers were coming off the franchise’s best season and were the critical darlings of many prognosticators. But then Jake Delhomme became Jake Delhomme and turned the ball over 13450924332 times. I bet he still wishes he could have gotten bailed out in the first quarter by Kimo von Oelhoffen. Sunday, January 17, 1:05pm EST, Fox. It is very possible that these are the two best teams in the NFL at the moment. One is the two-time defending conference champion, the other became the sixth team in NFL history to finish 15-1 and has a QB who is the shoo-in for league MVP. After four consecutive Seahawks victories over the Panthers (by an average of just under 7 points) Carolina finally took down Seattle this season in Week 6, with Cam Newton connecting on the game-winning touchdown to Greg Olsen. That felt like a seminal and tide-changing moment in Carolina Panthers franchise history – as well as the most frustrating and bitter moment in the Seahawks season. I believe the Panthers were the best team in football in 2015. You can find holes here and there; they did it without Kelvin Benjamin, relied perhaps too heavily on the likes of Ted Ginn, Jerricho Cotchery, and Devin Funchess, and had the luxury of playing ten games against the NFC South and AFC South. They haven’t played a team with a winning record since November 8, and had several games this year (including vs. Indianapolis, Green Bay, New Orleans, and the Giants) where they blew double-digit leads, but hung on to win. Sometimes it wasn’t pretty. Often times it wasn’t overly impressive on the field. But finishing 15-1, leading the league in scoring offense, rushing offense, and takeaways, and having the league’s best player score 45 touchdowns is undeniably impressive. The Seahawks weren’t exactly pretty either last week, relying on a bad offensive play, a bad defensive play, and a reprehensible special teams play by their opponent to win by a single point. Has there ever been a luckier team in NFL history than the Seahawks? I don’t deny that they’re immensely talented on both sides of the ball, but at this point, how can anyone be surprised anymore when these types of antics occur (Bill Barnwell had a perfect tweet about this). As a Seahawks hater, I knew that a 27-yard chip shot was too good to be true. I knew that Peterson would fumble at a critical time (ask Todd if you don’t believe me), just like I knew they would recover that stupid onside kick last year, just like I knew the refs would uphold the Fail Mary. I’m not Nostradamus. I’m a Seahawks hater. In many respects, Carolina is the most desirable opponent for the Seahawks. Without that Newton-to-Olsen touchdown, Seattle would be 5-0 against Carolina in the Russell Wilson era (never mind that each game was close, that’s just always how Seattle plays). Last week was the eighth time the Seahawks have faced off against a playoff team this season. This week will be the sixth time they’ve faced a playoff team on the road. They get back a healthy Marshawn Lynch, a healthy Luke Willson, and the weather will not be below zero. In his five games against the Seahawks, Cam Newton has thrown four touchdowns, five interceptions, has never rushed for over 42 yards, and has only completed 56 percent of his passes. Against the Panthers, Russell Wilson has thrown for seven touchdowns, three interceptions, and has completed over 68 percent of his passes. Look, it’s not rocket science here. Seattle had the tougher schedule; they have the better quarterback, the better coach, more playoff experience, resentment stemming the game earlier this season, and they have their best offensive player in the lineup once again. Carolina played weak teams all year, have only one playoff win in Cam’s career (vs. Ryan Lindley), will be missing one of its premier defenders (Charles Tillman), questionable receivers, and they give up leads. Cam’s stats look great, but he also had a completion rate under 60 percent and only had four games where he averaged more than five yards per rush attempt. Carolina comes in as the favorite because they won 15 games, but shared only two common opponents with Seattle: Dallas and Green Bay. The Panthers haven’t advanced past the divisional round since 2005. If you take the Panthers, you are choosing to believe that Ted Ginn, Greg Olsen, and Jerricho Cotchery can beat Richard Sherman, Kam Chancellor, and Earl Thomas. You’re choosing to believe that the team with the easiest schedule in the league – a team that struggled in December games against the Saints, Giants, and Falcons – can beat a team that has surrendered three offensive touchdowns in its last six games. You’re choosing to take the #1 offense over the #1 defense in a game where the latter hasn’t lost in the playoffs to an NFC opponent in three years. You’re choosing to take the quarterback that has been historically stifled over the quarterback that does this. I think it’s a no-brainer. Minnesota had its chance last week. That’s the closest it is going to get. Playoff doppelganger: 2010 NFC Divisional Round, Green Bay 48, Atlanta 21. The Falcons came into the game as the trendy #1 seed in the NFC, except they had played a fraudulent schedule with the exception of a three-point regular season win over the Packers. That was enough to rile Aaron Rodgers up, and he torched the Falcons much-vaunted defense for 366 yards and four total touchdowns. 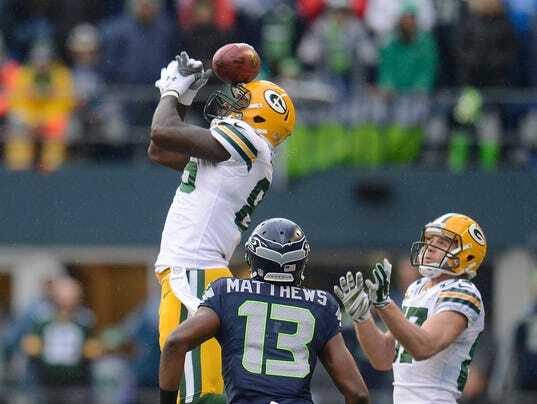 In the cases of both the Packers and the Seahawks, not having a bye may actually help preserve momentum and focus. Sunday, January 17, 4:40pm EST, CBS. Ten years ago, Ben Roethlisberger and the six-seeded Steelers marched confidently on the road in the divisional round and beat top-seeded Peyton Manning (due in large part to the unheralded defensive playmaking of Big Ben). Four years ago, the Steelers marched confidently into Denver in the divisional round and were 7½-point favorites over Tim Tebow, until this happened. Of course, Manning didn’t play for the Broncos in 2006, nor was he on the field in 2011, but hopefully you get the idea: This matchup, in whatever form it has taken, has given us some of the more remarkable and improbable results the past decade. There are a lot of unknowns in this matchup, but there are a few things we know for sure. One is that the 2015 Broncos were a very fortunate team. They were all but done in Kansas City until Jeremy Hill Jamaal Charles was given the ball late; they trailed the Patriots by two touchdowns in the fourth quarter until the refs suddenly remembered who they were rooting for and commenced calling excessive penalties on Rob Gronkowski; they survived overtime contests against the Browns and Bengals, and somehow beat San Diego in spite of five giveaways. Their quarterbacks combined for 23 interceptions, a 76.3 QB rating, and 12 wins. They had no major injuries to speak of all season (outside of Manning’s, which may have given him two months of significant rest) and four of their five wins over playoff teams came at home (the only win was the infamous Chiefs game at Arrowhead). We also know that after last week, the Steelers are considerably banged up, with likely game-time decisions for DeAngelo Williams and Antonio Brown, as well as a beat-up Roethlisberger, but still . . . Denver is a seven-point favorite? Am I not understanding something here? The Broncos beat only four teams all season by a touchdown or more, while four of the Steelers’ five losses with Roethlisberger under center were by seven points or fewer. Four weeks ago, on December 20, the Broncos not only lost to the Steelers, but gave up the most points in any game they played all season (34). And oh yeah, Denver’s starting quarterback has lost six times in the divisional round, and has gone one-and-done in the playoffs a record nine times. It’s certainly a considerable advantage for the Broncos if Williams and Brown cannot play. Denver’s unequivocal strength is its top-rated defense, which went 11-1 in games allowing 24 points or fewer. They only gave up one 300-yard passer all season (you guessed it) and in the December 20 game, Williams was a virtual non-factor, rushing 14 times for only 26 yards (Emmanuel Sanders nearly outgained him on the ground on one carry). The Broncos scored 27 points in the game’s first 28 minutes, before Osweiler and company were shut out in the second half. I watched that game and neither team looked perfect, with each throwing pivotal interceptions in the game’s final five minutes. I will say that I cannot imagine Denver players being too thrilled with the way they finished that game. The Sheriff Manning will of course be an important factor, but I feel like the Broncos are the kind of team that can survive a 120-yard, 2-interception performance (oddly enough, I feel that way about the Steelers too). And the question must be asked: If Manning is in the midst of another divisional round dud, why wouldn’t Gary Kubiak pull the trigger and put Osweiler in? Denver went 8-1 in games where they rushed for 100+ yards (again, you can guess where their one loss came). Pittsburgh’s defense has played quietly well against the run all season, and if you take away the one long gain surrendered to Jeremy Hill, the Bengals only ran 23 times for 53 yards last week. But if the Steelers’ run defense has been quiet, the Broncos’ run defense has been booming, allowing only one 100-yard rusher all season (this time it might not be who you guessed). If you’re picking the Steelers in this game, you believe that Manning’s two months of rest will have little impact on his well-documented playoff demons. You believe that Pittsburgh can score 24 points against anyone, at any location, and you believe that Fitzgerald Toussaint, Jordan Todman, and Martavis Bryant can make up for the losses to Williams and Brown (who may still play anyway). You believe that Roethlisberger has won more Super Bowls than Manning for a reason, and you know that the only thing fluky about the December 20 game was how bad the Steelers defense played against Brock Osweiler in the first half. Those are not necessarily bad points to make, but for me, they do not add up to enough confidence to realistically take the Steelers in this game. If you remember correctly, Pittsburgh just nearly blew a 15-point fourth quarter lead to A.J. McCarron, and was bailed out by extremely fortunate penalties (and a few horrendous no-calls). This season, the Steelers played poorly on the road in New England, Kansas City, Seattle, and Baltimore, and with the exception of Kansas City, those games were played with healthy lineups intact. Pittsburgh has turned the ball over two or more times in 10 of its past 11 games; Denver is 11-1 in games where they forced one takeaway. Toussaint and Todman played well last week, but that was by far the most relevant either runningback has been in a game the past two seasons (you have to believe Cincinnati’s defensive scheme was more focused on eliminating Brown and Bryant). We all know Peyton Manning isn’t necessarily Tom Brady when it comes to playoff football (nor is Brock Oswiler). But I also know what network the game is on, and I talked about talking about which legendary announcing pair will be talking about how Peyton Manning just had the most noble and distinguished season of his amazing career (anything else is heresy). Picking against The Sheriff is a grievous violation of taste and ethics that may be punishable by being exiled to Cincinnati and its thuggish fans. Prediction: Denver 19, Pittsburgh 16. Playoff doppelganger: 2004 AFC Divisional Round, Pittsburgh 20, NY Jets 17 (OT). Maybe this comparison is a cop-out since the 2015 Broncos are basically the same fraudulent team as the 2004 Steelers, but for no other reason, the two teams represent the pinnacle of winning games in truly lucky fashion. The Jets had a +2 turnover margin in the game, and could have sealed victory on two separate occasions, but perhaps inevitably, Doug Brien pulled a Blair Walsh both times. I hated that game, and I hate the two teams involved in this matchup.